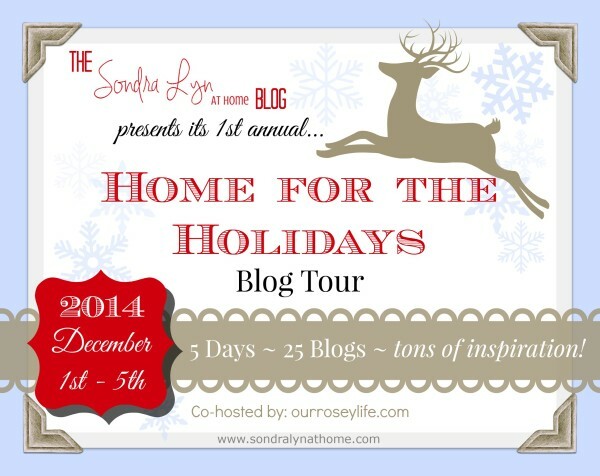 I’m super excited to be participating in the first annual HOME FOR THE HOLIDAYS BLOG TOUR brought to you by Sondra Lyn at Home so make sure you scroll down to the bottom of this post to see many more great crafts, recipes, and Christmas decor. Ever since Leo and I started our garden five years ago, we’ve become known locally as “The People with the Garden.” And I’ll have to say that when we started it, that we never would have thought that it would give us so much satisfaction and pleasure. It is so much more that just growing most of our own food-it has become a way of life. So to celebrate the joy we get from gardening, I decided to decorate our living room with a gardening theme in the traditional colors of red and green. 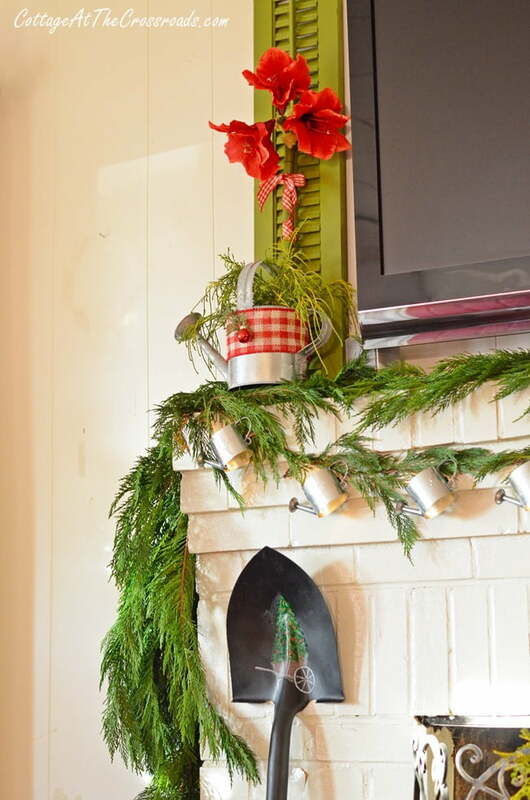 On top of the mantel, I’ve used a red and white checked bow along with a watering can garland with lots of Leyland and Mophead cypress from the yard. I left up the green shutters that I put on the mantel this summer and added 2 larger watering cans and some amaryllis flowers. And shovels! 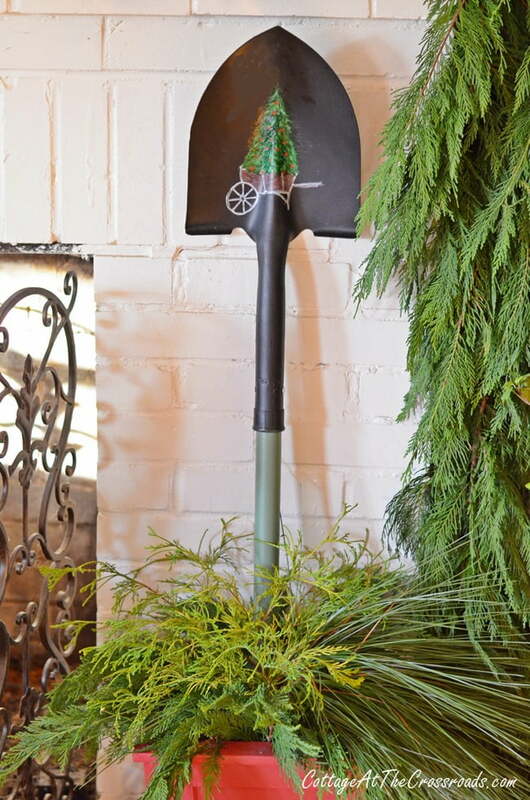 Who can garden without shovels? 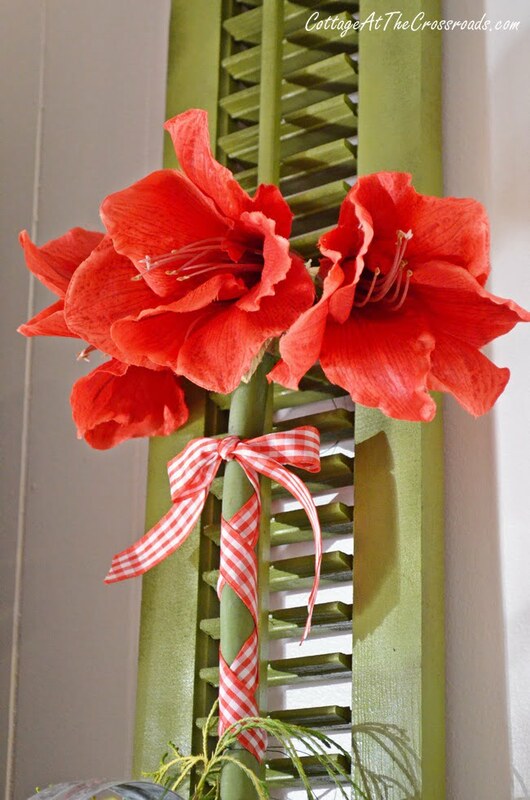 The amaryllis is a classic winter blossom that is associated with Christmas. This one is an artificial one since I knew a real one would never last through the holidays! 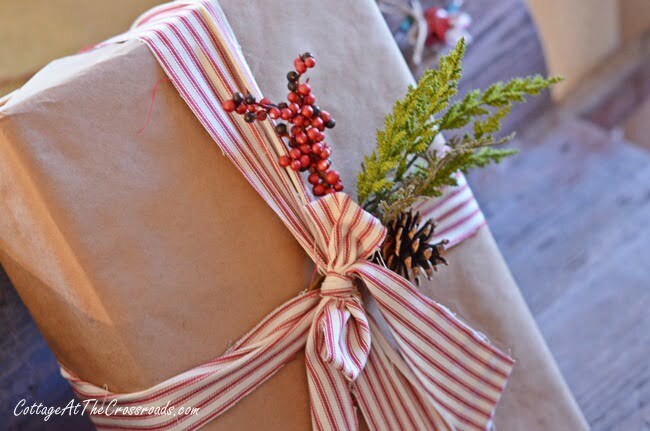 The beautiful red color looks so festive especially when tied with a red gingham ribbon! 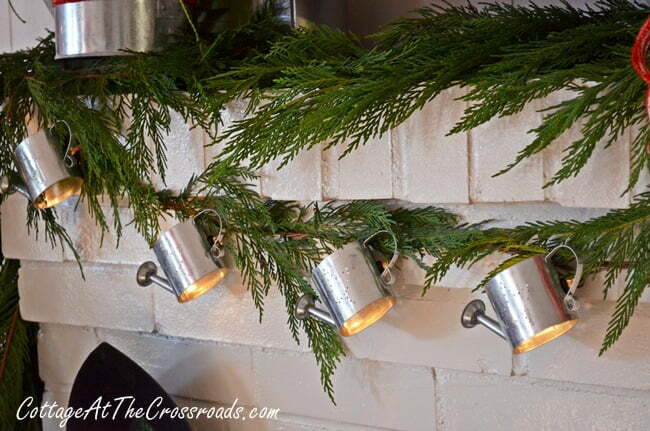 The watering can garland is made from patio lights that I found online. The shovels were handpainted by my friend Marti Dunn. 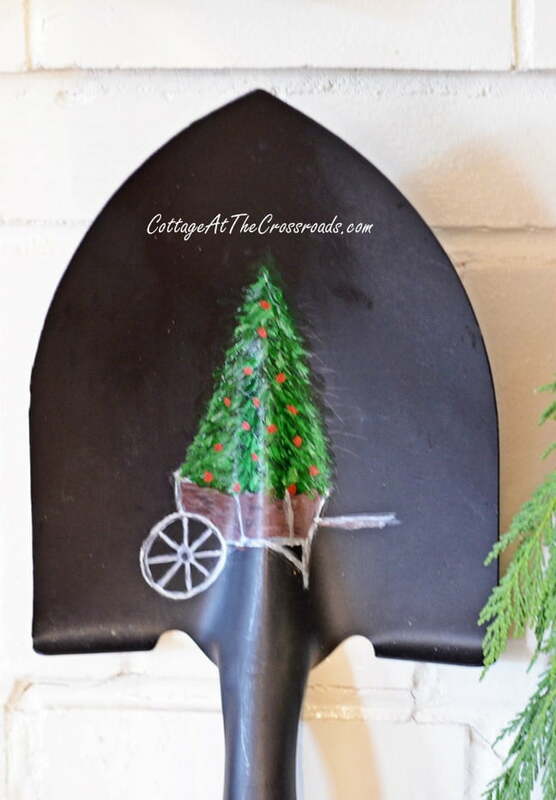 Here’s a closeup of the wheelbarrows and trees that she painted. Didn’t she do a great job? 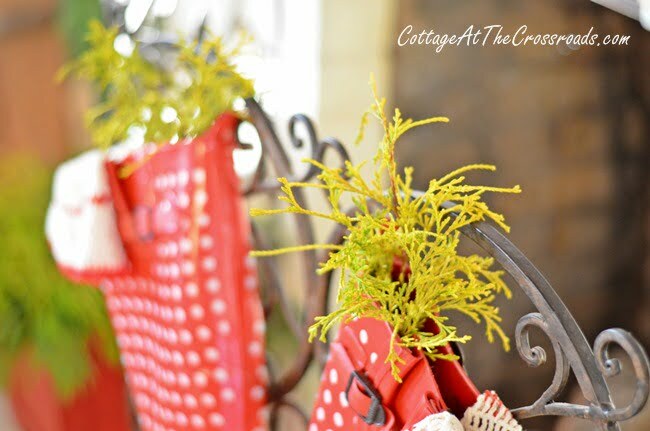 Instead of hanging stocking this year, we hung some gardening boots which I adorned with vintage doilies and greenery. Hope Santa doesn’t get mistaken and put these on when he’s here! 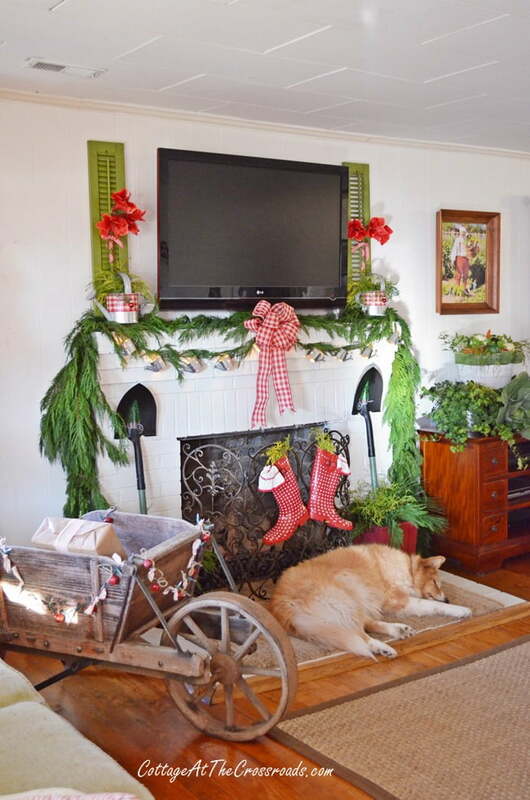 To the left of the fireplace is our vintage wheelbarrow that we found at the auction. I asked the man that we bought it from where he had obtained it and he said that he bought it at a farm auction in Lancaster, South Carolina. He said he was pretty sure it was made by the Amish. I’m in LOVE with the wheelbarrow! Lucy is in LOVE with her naptime! I’m pretty sure she’s worn out from digging holes in the garden earlier today. It was such a pretty day today and Leo worked out in the garden taking up the landscaping fabric and straw. You know, there’s no rest for the gardener since there’s always something that needs to be done. 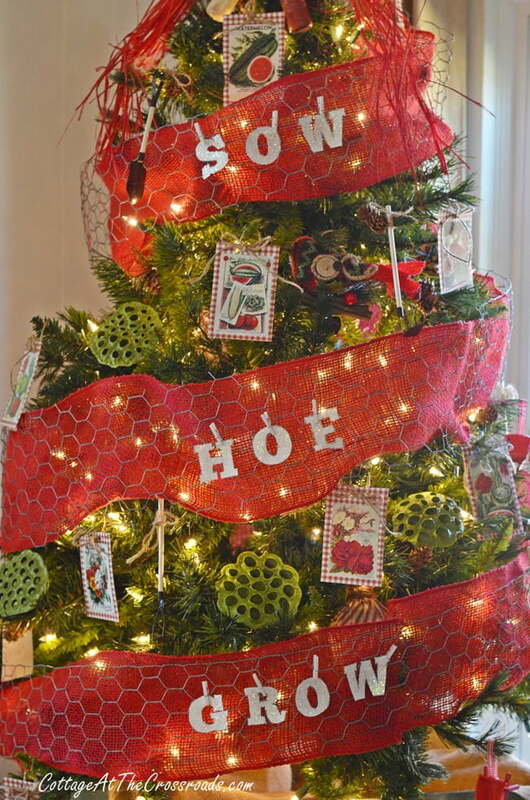 I’m calling our tree the “SOW-HOE-GROW” tree. It’s a bit of a tongue twister. Go ahead and say it 3 times! The tree is adorned with ornaments that I made with seed catalog and seed packet artwork from the late 1800s. And do you see the little red wheelbarrow? I found those in the dollhouse furniture section of Hobby Lobby. 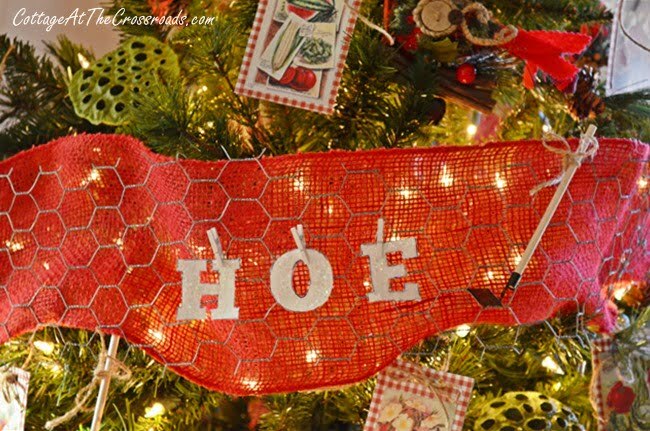 And there are some little tool ornaments on the tree such as this hoe. 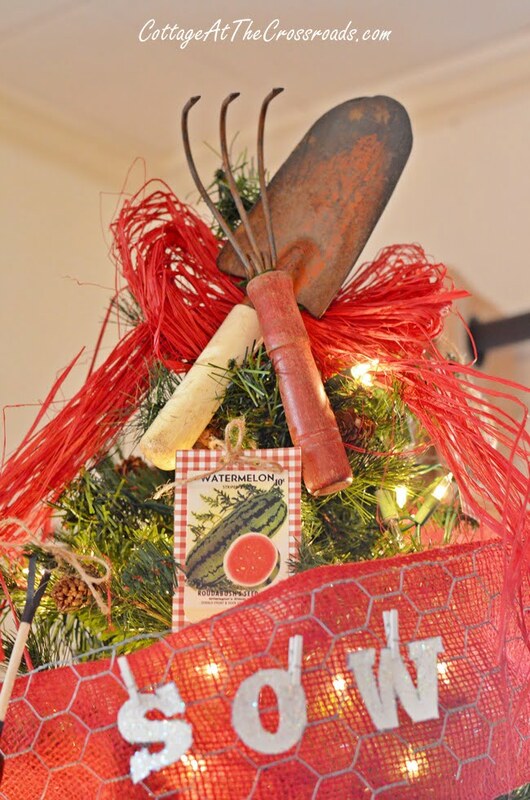 The tree topper was made from some vintage gardening tools that I already had. And to cover the tree stand, Leo made a box for me and I painted it to look like an old seed box. Rascal thinks that we put the box under the tree just for him! The wheelbarrow will hold the gifts this year. Leo didn’t quite understand why I wrapped one gift in brown craft paper today! To the right of the fireplace is my new Santa print! But it looks like his elves do all the real work! Underneath the print I created a display using a basket filled with veggies, ivy, and cabbages from our garden. 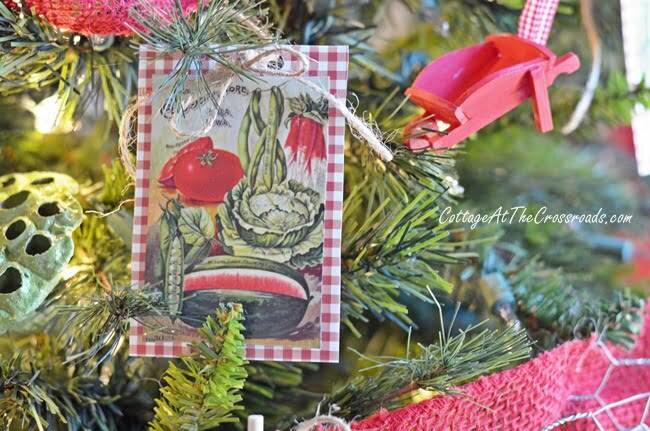 I bet you’ve never thought about using cabbages as Christmas decorations, have you? Hmmm, I didn’t think so, but aren’t they beautiful? I thought they were so pretty that I put one in my old dough bowl along with some pine cones that I painted red. Yes, I guess you could say that gardening has become a bit of an obsession for us. 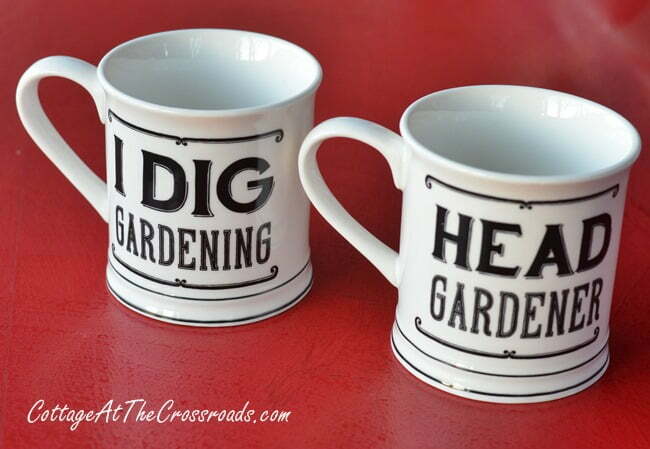 So much so that we are now drinking our coffee from our new gardening mugs! Can you guess who’s the head gardener? WOW!!!!!!! This is definitely the most clever Christmas decor I’ve seen! I cannot believe how perfect those cabbages look mixed in with pinecones and greenery! I never would’ve thought of that! 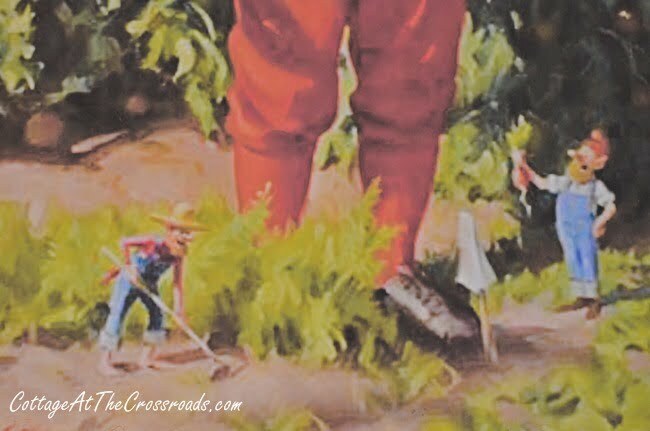 Though I think my favorite detail is the pair of gardening boots! So perfect! How cute have you decorated! 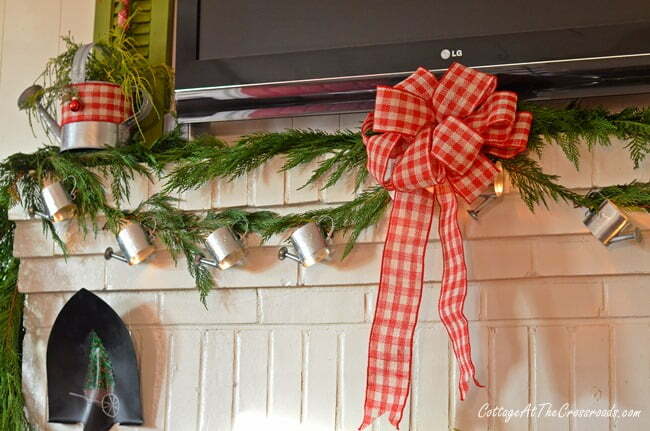 Love your mantel… so many cute touches! Jane I love love love your mantel…the whole area looks beautiful!! Love your adorable pup too…so sweet!! Too darn cuuute!! 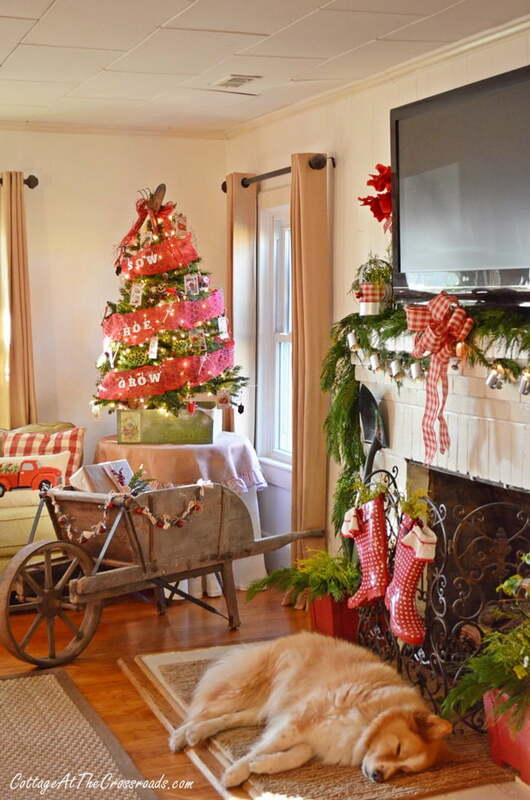 !….Love all of your gardening details from the garden boots in lieu of stockings to the cabbage arrangements….love the wheelbarrow in the room…and of course the star of the show, Lucy the Wonder Dog….she is just tired of supervising the decorating…Definitely one of my favorite themed rooms this year Jane!! Hoe Hoe Hoe! Santa is putting you and Leo on his nice list! 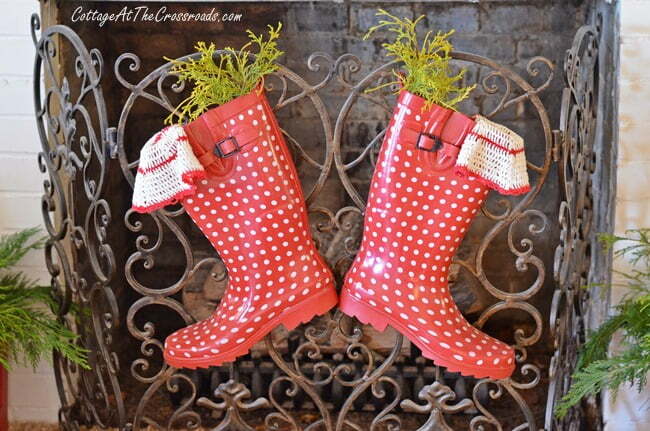 Love the rain boots as stockings and your gardening touches! Such a fun, festive, creative home tour! 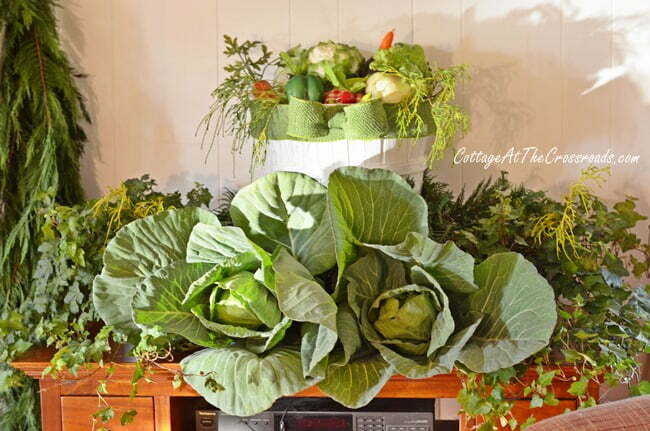 I love this…….especially the cabbages! Never thought of that!!! Your sweet fur baby by the fire place is priceless! Enjoy the season! Just can’t say enough about how cute and inspirational this theme it is! The wheel barrow is my favorite! Each detail is so cute! 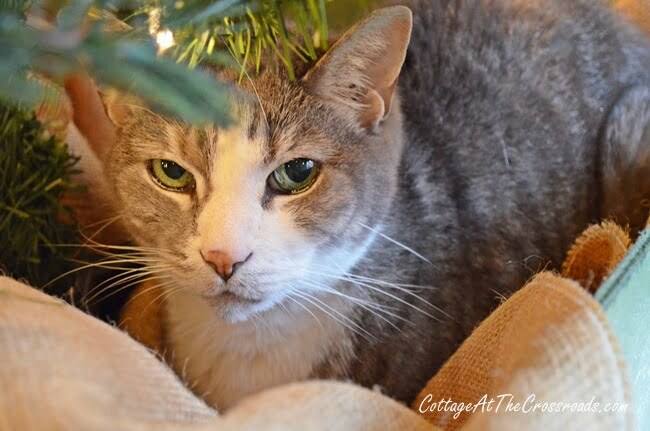 I can’t believe you even cut the chicken wire to fit with the garland on the tree! I did a little garden theme in my kitchen window- this inspires me to post it! Thanks for sharing- your creativity is amazing! This is the BEST! I also love my yard and gardening so this is so fun to me!! You guys did a fabulous job, thanks so much for sharing. what a creative and different way of decorating! 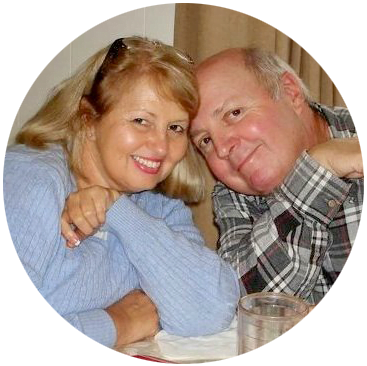 I loved your wheelbarrow and shovels, your dog, the way you incorporated your love of life into it, well, everything! Oh my gosh I don’t even know where to start! It’s all so amazing. That watering can garland is the cutest thing I’ve ever seen. I went with a little tree too this year. I totally think they do the trick! Loved seeing everything. So unique, and very pretty! Great idea!! Way to carry out a theme! And so cute and original. Love it all. Love the theme idea Jane and the garden boots are the perfect touch. It all looks garden good. 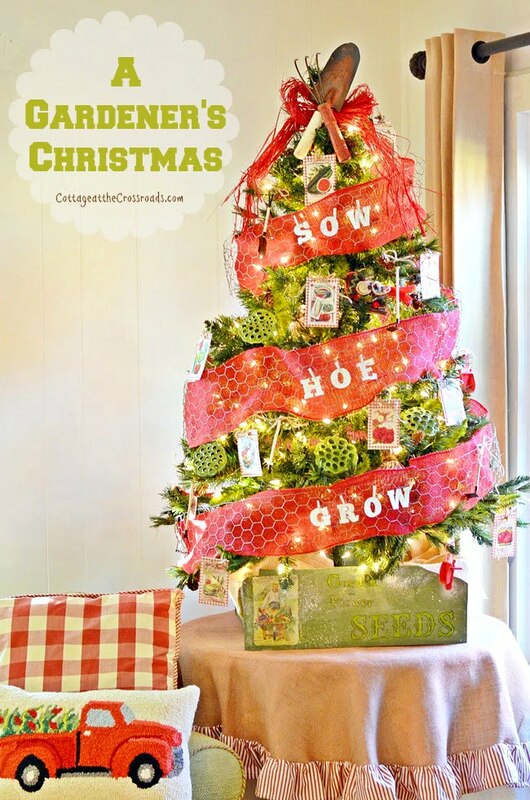 Beautiful,creative and amazing decoration idea for this Christmas.Thanks for sharing this so much nice idea with us. Woowww, Jane. You should win an award of some kind for this. Fantastic job! Your decor is absolutely stunning! My favorite Christmas decor ever! It’s so bright, colorful, and really reflects you. I love it! How creative! I love your theme and how you used so many garden details in everything! Awesome job and I love all the details you put into everything! Jane, this is the best decor I have seen this Christmas. It is so near and dear to my heart too. We have a little garden so I was ooooohing and awwwwwwing through the whole post. LOVE the tree!!! 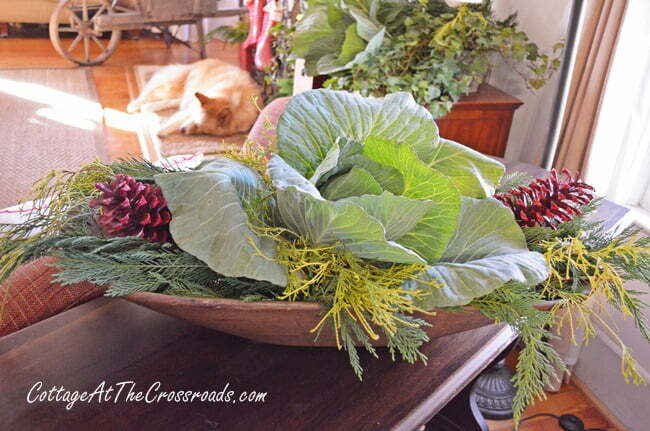 And I think cabbage makes gorgeous Christmas decor!!! Brilliant and creative, my friend! Most original I’ve seen in my blog browsing today. Love your attention to detail and creativity! So enjoyed this post. I love every single detail of your garden themed Christmas decor. The painted shovels were the first thing that caught my eye. Your wheelbarrow is such an interesting piece and I love that it is Amish made. 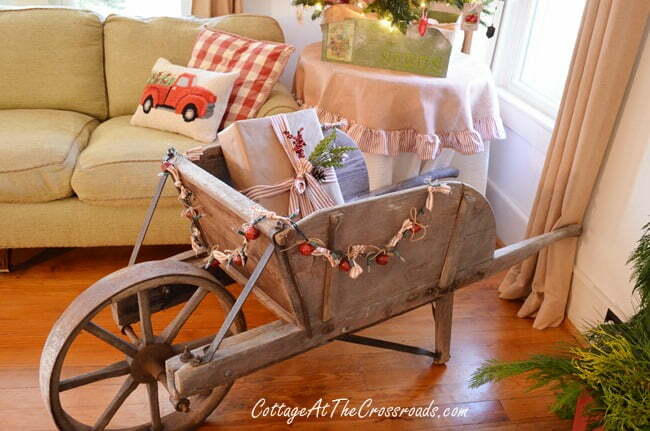 My parents had an old wheelbarrow with a metal wheel that I wish I had for my own decorating. (I’m pretty sure it’s no longer around.) I look forward to seeing what else you have in store for December. I can’t even begin to describe how much I love every single detail-it’s amazing!! Sharing on my FB page and pinning! Wow, oh, wow, Jane and did I say WOW! Over the top creative one of a kind and cute!! Love it all and that is funny that your kitty found the box. We had a cat that would climb up in the tree and sleep. Fell over twice. Oh, Jane! It’s fabulous! You had me at the tree. Every detail is so perfect… down to the gardening boots as stockings. 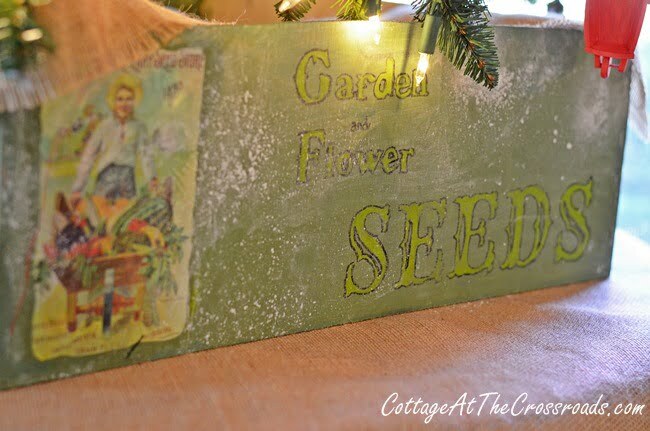 I love the green of your shutters, the cabbages, the painted shovels… and your seed box- wow! Thanks for participating in the Home for the Holidays Tour! Most creative room I’ve seen this year! More ideas than I could take in. 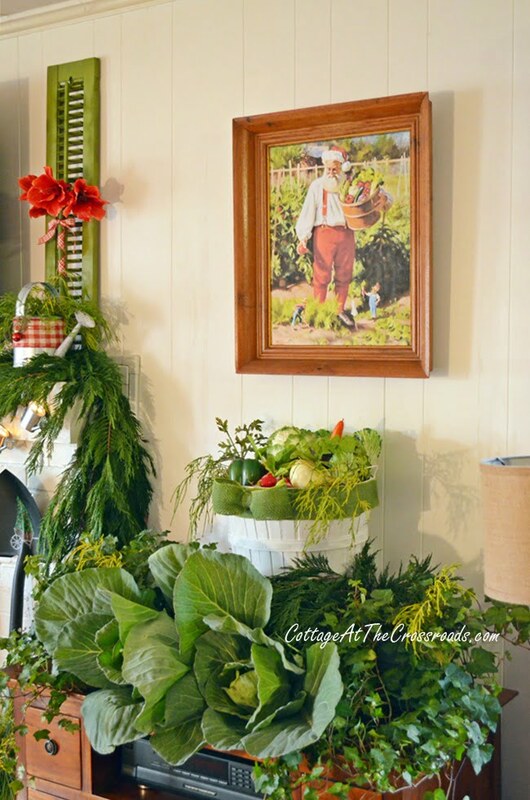 What a wonderful theme for a gardening family or a sunroom. Kudos! I love it. Best Christmas decorations yet. 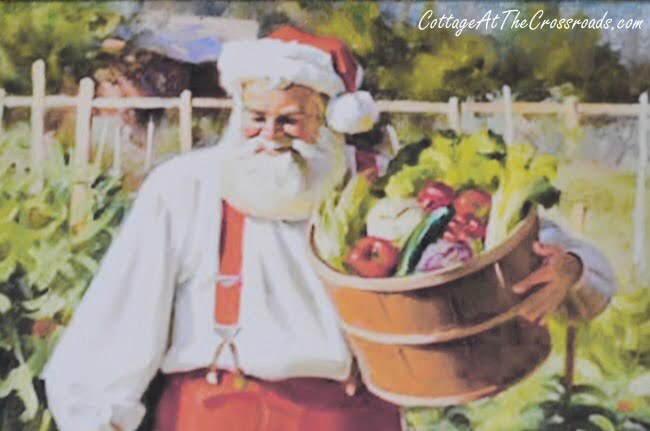 The cabbages are wonderful, and I love your Santa print. I was drawn to your blog by the garden. 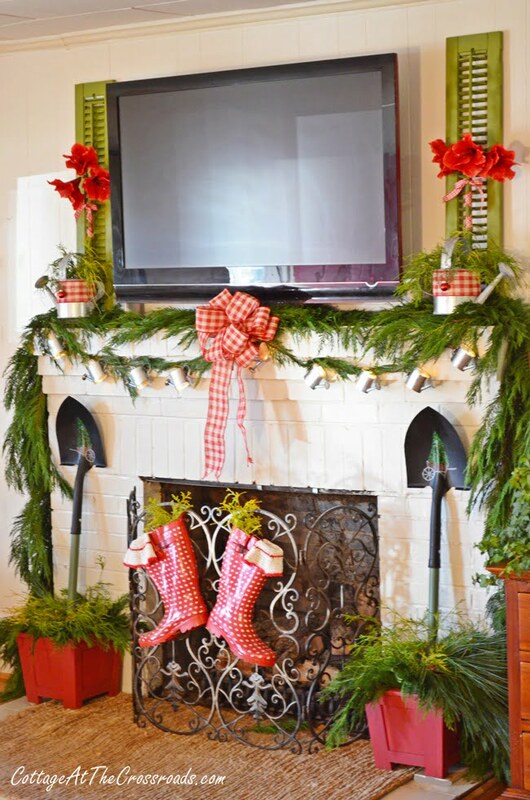 Jane – I absolutely love everything about this room from the tree to the boots hanging on the fireplace screen to your gardening Santa!!! !